Analysis: Agholor saved his biggest game of the season for when it mattered most, as this effort marked his only 100-yard game of the season thus far and his first touchdown since Week 2. 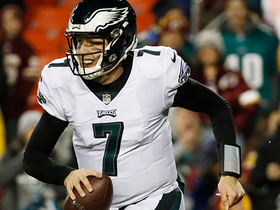 His third-quarter score accounted for most of his yardage when Nick Foles lofted a perfectly placed ball and hit the USC product in stride with a step on his man on the way to the end zone. It is unlikely he will repeat the effort Week 17 at Washington. Agholor caught two of three targets for 49 yards in Sunday's 29-23 loss to the Cowboys. Agholor caught four of eight targets for 56 yards in Monday night's 28-13 win over Washington. Analysis: After just one catch in three opportunities over his past two games, Agholor surprisingly finished second on the team in targets behind only Zach Ertz. The USC product also played 65 snaps, just one fewer than Alshon Jeffery, 29 more than Golden Tate, and the most the fourth-year vet had seen since Week 4. Still, because of his inconsistent production over the past several games and a difficult matchup at Dallas up next, fantasy owners will probably want to turn elsewhere for Week 14. Agholor made just one 12-yard reception in Sunday's 25-22 win over the Giants. Agholor was unable to catch either of his two targets in Sunday's 48-7 loss to the Saints. Agholor caught five of seven targets for 83 yards in Sunday's 27-20 loss to the Cowboys. The Eagles are hopeful the recent addition of Golden Tate will create more open looks for Agholor, Graham Foley of the Eagles' official site reports. Agholor caught three of six targets for 49 yards and gained 14 more yards on his lone carry in Sunday's 24-18 win over the Jaguars. 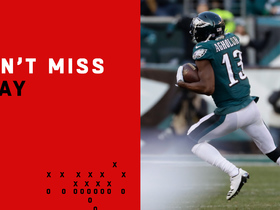 Agholor caught six of seven targets for 20 yards in Sunday's 21-17 loss to Carolina. Agholor brought in three of five targets for 91 yards in the Eagles' 34-13 win over the Giants on Thursday. Agholor caught all four of his targets for 45 yards in Sunday's 23-21 loss to the Vikings. Analysis: Despite seeing fewer opportunities than he had all year, Agholor still gained more receiving yards for the Eagles than anyone not named Zach Ertz. However, Ertz and Alshon Jeffery saw a combined 19 targets in the contest, dwarfing the 25-year-old's total. Agholor has made at least four catches in every game this season but has only produced more than 45 yards once so far. He'll try to break out against the Giants in Week 6. Agholor caught five of 12 targets for 22 yards during Sunday's 26-23 loss to the Titans. Agholor caught four of his five targets for 24 yards in Sunday's 20-16 win over the Colts. Agholor will remain the Eagles' No. 1 wide receiver for the foreseeable future with Alshon Jeffery (shoulder) week-to-week and Mike Wallace out for the next few weeks due to a fractured fibula. Agholor brought in eight of 12 passes for 88 yards and a touchdown in the Eagles' 27-21 loss to the Buccaneers on Sunday. 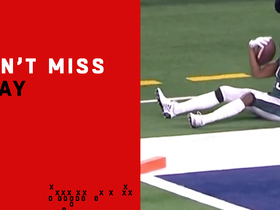 He also rushed once for two yards. Agholor hauled in eight of 10 targets for 33 yards in the Eagles' 18-12 win over the Falcons on Thursday. 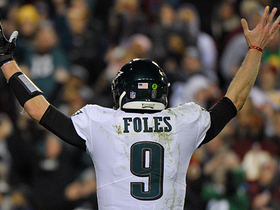 He also completed his sole pass attempt for 15 yards to quarterback Nick Foles and rushed once for 16 yards. Agholor will lead an undermanned Philadelphia wideout corps with Alshon Jeffery (shoulder) expected to miss the first two weeks of the season, Zach Berman of The Philadelphia Inquirer reports. Agholor (lower body) returned to practice Sunday, Martin Frank of The Delaware News Journal reports. Analysis: Meanwhile, Alshon Jeffery (shoulder) remains sidelined, leaving Agholor as the team's top wideout who is healthy enough to practice. As a starter in the Eagles offense, Agholor already has a decent floor from a fantasy perspective, with the potential for added opportunities if Jeffery's absence lingers into the regular season. Agholor (lower body) is working with Alshon Jeffery (shoulder) on a side field during Monday's practice, Dave Zangaro of NBC Sports Philadelphia reports. Agholor (lower body) is considered day-to-day, Les Bowen of the Philadelphia Daily News reports. Analysis: Lending further confidence to the report that Agholor's undisclosed injury isn't too serious, Eagles coach Doug Pederson said the receiver is now considered day-to-day. Fellow starting wideout Alshon Jeffery (shoulder) remains on the PUP list, leaving Mike Wallace and Mack Hollins as the primary receiving options heading into Thursday's dress rehearsal against the Browns. Agholor is recovering from an unspecified lower body injury and should be ready for Week 1, Jeff McLane of The Philadelphia Inquirer reports. Agholor (undisclosed) isn't practicing Tuesday, Zach Berman of The Philadelphia Inquirer reports. Analysis: Agholor didn't play in the Eagles' preseason opener and hasn't practiced since. He did at least get some work in with the team's training staff prior to Tuesday's practice, perhaps hinting that he's close to a return. It's safe to assume the 25-year-old wide receiver won't play in Thursday's preseason game against the Patriots. 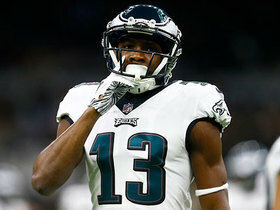 Agholor (undisclosed) will miss a fourth consecutive practice Monday, Zach Berman of The Philadelphia Inquirer reports. Agholor (undisclosed) isn't practicing Sunday, Reuben Frank of NBC Sports Philadelphia reports. Analysis: Agholor hasn't practiced since Monday and was held out of Thursday's preseason opener. With nothing to prove in terms of his role in the Philadelphia offense, there won't be any cause for concern unless Agholor is also held out for the second and third weeks of the preseason. Agholor (undisclosed) is not on the field for practice Saturday, Eliot Shorr-Parks of NJ.com reports. Analysis: Agholor skipped Thursday's preseason opener as well, though the team has yet to provide an update on the reason behind his absence. There's also no indication the issue is serious and the team has no reason to press its first-string players during the preseason, so it's best to consider Agholor day-to-day unless something new suggests otherwise. 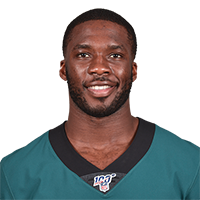 Agholor isn't in uniform for Thursday's preseason contest versus the Steelers, Zach Berman of The Philadelphia Inquirer reports. The Eagles exercised the fifth-year option on Agholor's rookie contract Monday, Albert Breer of TheMMQB.com reports. Agholor (illness) brought in nine of 11 targets for 84 yards and rushed once for nine yards during the Eagles' 41-33 win over the Patriots in Super Bowl LII on Sunday. Agholor (illness) is active for Sunday's Super Bowl versus the Patriots, Adam Schefter of ESPN reports. Analysis: A number of Eagles battled the flu this week, but Agholor was the first skill-position player to be afflicted by the bug. After receiving an IV early Saturday, he's been given the thumbs up to partake in the biggest game of his life. 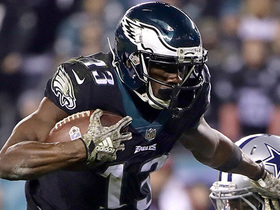 Through the team's two playoff outings, Agholor managed to catch six of seven targets for 83 yards and record three carries for 20 yards. Agholor received an IV early Saturday to address flu-like symptoms, but the illness isn't expected to impact his status for Sunday's Super Bowl matchup with the Patriots, Ian Rapoport of NFL Network reports. Analysis: The Eagles neglected to add Agholor to their Super Bowl injury report after the wideout fell ill, so it appears there's no concern about the 24-year-old's status for the biggest game of his career. Though Agholor may not be 100 percent healthy, the illness isn't expected to result in any notable reduction in his snap count. Agholor reeled in seven of nine targets for 59 yards and a touchdown during Sunday's 34-29 win over the Giants. Agholor caught eight of 11 targets for 64 yards in Sunday's win over the Rams. Analysis: Coming off a career day in Week 13, Agholor still managed to outdo the seasonal marks he had set then with eight receptions and 77 snaps in this one. The eleven targets tied Alshon Jeffery and Torrey Smith for the team lead on the day. The breakout third-year receiver will have a much better matchup in Week 15 versus the Giants, which may compensate some for the loss of Carson Wentz (knee). Agholor caught seven passes on 12 targets for 141 yards and a touchdown during Sunday's 24-10 victory over the Seahawks. 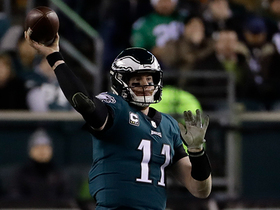 Agholor caught three of six targets for 36 yards and a touchdown and recovered a fumble in the end zone for a second score in Sunday's 31-3 win over the Bears. Agholor caught one of five pass attempts for a loss of two yards in Sunday's win over the Cowboys. Analysis: Agholor saw his usual number of snaps and targets, but was unable to make anything of them in what was an off day for the Eagles' passing attack. It was only the second week all year that he failed to reel in more than one reception or rack up at least twenty yards. He will try to get back on track in Week 12 versus Chicago. Agholor caught two of four pass attempts for 36 yards in Sunday's win over the Broncos. Analysis: Thirty-five of the yards came on a deep ball from Nick Foles that set up the Eagles' final touchdown of the game, well into garbage time. 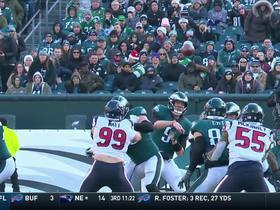 Prior to that, the third-year pro was unable to get in on the blowout, seeing just one other deep ball and two short targets from Carson Wentz. The former Trojan will try to rebound after the bye with a much juicier matchup against Dallas in Week 11. Philadelphia Eagles wide receiver Nelson Agholor hauls in an 83-yard touchdown pass from quarterback Nick Foles. Philadelphia Eagles wide receiver Nelson Agholor makes an incredible grab while falling down. 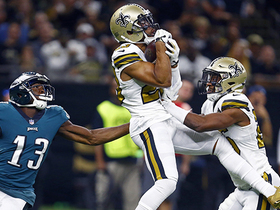 New Orleans Saints cornerback Marshon Lattimore picks off Philadelphia Eagles quarterback Carson Wentz's deep pass. Philadelphia Eagles wide receiver Nelson Agholor snags a laser pass from his quarterback Carson Wentz for 13 yards. 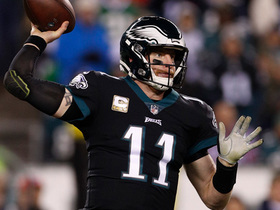 Philadelphia Eagles quarterback Carson Wentz launches a pass deep to his wide receiver Nelson Agholor for 51 yards.